The most important 22 words as to whether you can make a difference. It doesn't matter whether you want to make a difference to people, profits or to the planet because if you don't get your 22 words right, you won't get noticed. Why? Google search displays on average 22 words from the description you've used for your homepage (or landing page). Try a google search now to see for yourself. That's why they are the most important 22 words to help you make a difference. Those 22 words must compel people to visit your homepage/landing page. How compelling are your 22 words? The world is getting quicker ...and smaller! To make matters worse, Google now shows a thumbnail image of your website next to your search result. So your would-be customers don't need to visit your website to get an idea as to what you are really about. The good news is you no longer have to suffer the embarassment of high bounce-rate. The bad news is that's because you're not getting any visitors at all because they've seen enough from your website thumbnail. In effect, Google search is now just one humungous trade magazine full of one-page adverts. We live in a 3-seconds world - that's how quick. Do you know the most important creative brief for magazine adverts? It is that the advert must grab the reader's attention and convey what is being sold in less than 3 seconds. 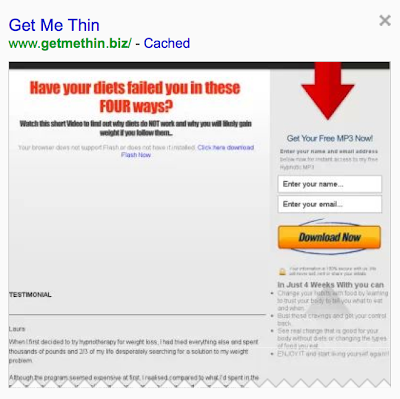 So, how compelling is your landing page when viewed as a thumbnail? Does it pass the 3 seconds test? 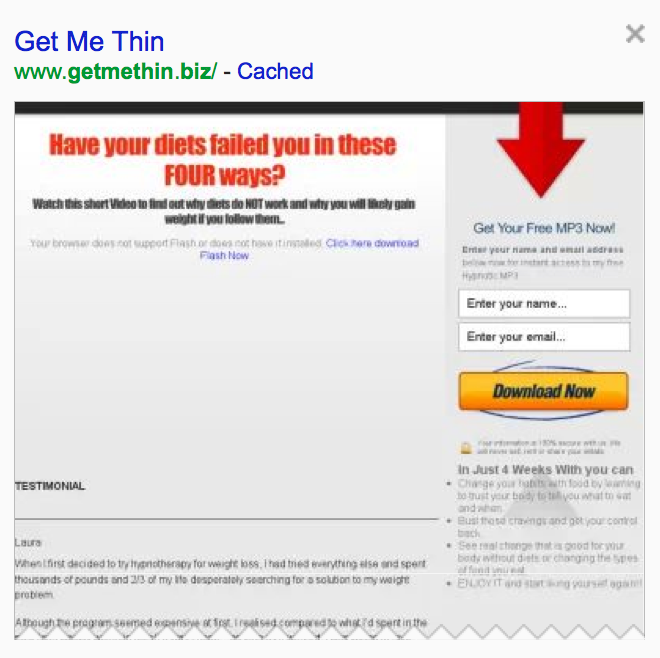 Here is a really good example of how you can make your lead generating landing page different. The two example Google's thumbnail homepages are from the same business wanttochange. It's about getting to your ideal weight. Which one delivers the message with more clarity, content and impact? You can make your mind up. 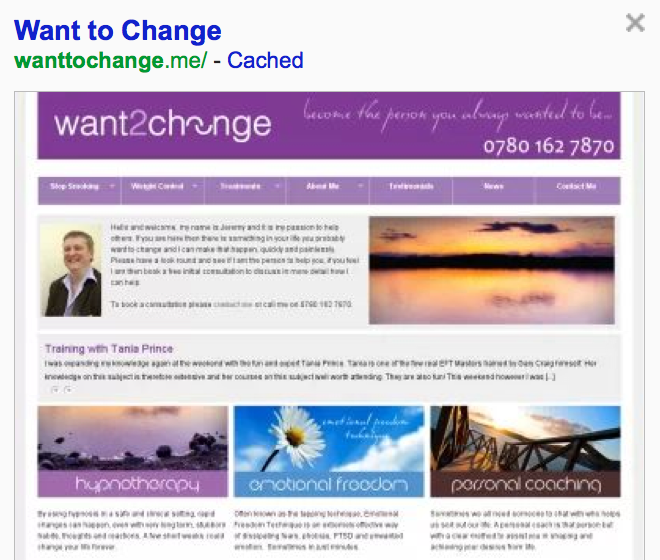 Jeremy (a hypnotherapist remember) created the second website below himself with our help. Yes, he did the work (not us) using our methodology. Less is definitely more when it comes to landing pages that capture leads. Of course, having leads and converting them into clients who pay is entirely a different website function and that's why websites with 'one trick pony' landing pages rarely succeed in converting their opt-in list. Subscribe to our short video series to find out why achieving higher conversion rate needs more than an opt-in box on your landing page.